TORONTO, ON – Calling all Super Heroes! 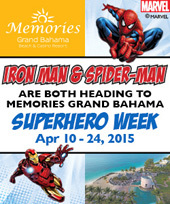 Memories Grand Bahama Beach & Casino Resort is hosting a themed Super Hero Week from April 10 – 24, 2015. With Iron Man and Spider-Man on-site to fight off goons, fans will be treated to special activities including nightly Marvel® movie showings under the stars, “Super Hero 101” workshops, photo opportunities, costume parties, meet and greets, and more. THE PERFECT VACATION HAVEN FOR ALL! Our tropical all inclusive resort is inspired by the sun-kissed beauty and rich culture of Grand Bahama Island. Occupying a half mile of pristine beach just outside of Freeport, this expansive property offers restaurants, on-site spa services and gym, a unique pool built around a stone sugar mill, and a nearby casino and golf course. Green Globe congratulates Memories Resorts & Spa on the certification of Memories Grand Bahama Beach & Casino Resort and Memories Splash Punta Cana for their sustainable operations and management. Green Globe is the only international program to recognize companies within the travel industry demonstrating long-term commitment to incorporating sustainable practices throughout their day-to-day operations. 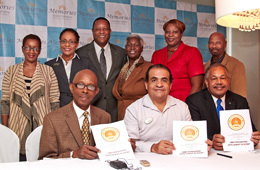 Freeport, Bahamas - College of the Bahamas has signed a deal with Memories Grand Bahama Beach and Casino Resort for COB to train 700 of Memories' hotel staff in 2015 on December 17th. Training will be throughout the year with COB’s Culinary and Hospitality Management Institute (CHMI). Freeport, Bahamas - Over 500 attended the second annual Culinary Fusion Expo held at the Canal House, Pelican Bay Hotel in Grand Bahama. The event showed exponential growth with vendors and attendees this year. There were nothing but positive reviews. For only a $40 entrance fee participants were able to nibble and sip all evening on the best tastes that Grand Bahama have to offer. Mojo's Restaurant came in from Nassau and it's anticipated that next year more vendors from the other Bahamian islands will come in for the event. 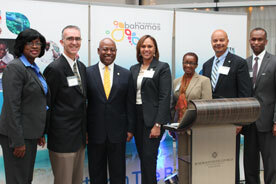 CANADA - Bahamas Ministry of Tourism officials where in Vancouver, British Columbia on October 21st to officially launch a weekly flight service to Grand Bahama Island via Sunwing Vacations starting on November 1st, 2014. The entourage included the Hon. Minister, Obediah Wilchcombe; Director General, Joy Jiburilu; and Deputy General of Tourism, Ellison Thompson. Representing Sunwing Travel Group was Graeme Franklin, Director of Sales. Departing initially on Saturdays, the flight becomes a direct, non-stop service departing Fridays from December 19, 2014. 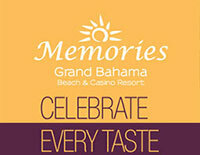 Freeport, Grand Bahama Island - Enjoy sumptuous dishes at Memories Grand Bahama Beach Resort's 4 restaurants and refreshments at 6 themed bars. Unlimited reservation-free gourmet dining plus 24hr snacks and unlimited international drinks. 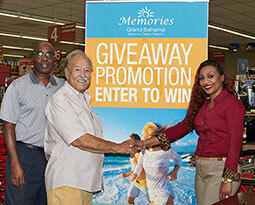 Freeport, Grand Bahama Island – Local retail giant Dolly Madison Home Center and the new all inclusive Memories Grand Bahama Beach and Casino Resort have teamed up to reward residents for shopping at home. 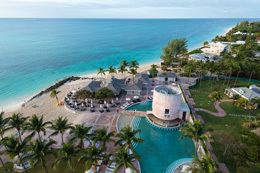 Under the theme, ‘Buy Local’, when shoppers spend $20 or more at Dolly Madison from now until October 10th, 2014, they become eligible to enter to win luxurious all inclusive one night stays for two adults plus two children (ages 12 or under) at the beautiful Memories Grand Bahama Beach and Casino Resort. The campaign officially kicked off Thursday October 18th, 2014 and was inspired by what Mr. Don Roberts of Dolly Madison referred to as “the need for locals to support their own economy”. Freeport Grand Bahama Island - The all inclusive Memories Grand Bahama Resort & Spa invites you to bring your entire family! Fun-filled activities designed for a range of ages, feature kids' characters, special and safe facilities, cartoons, games and playgrounds. Fun-filled activities for children ages 4-12 years old, feature kids' characters, special and safe facilities, cartoons, games and playgrounds. 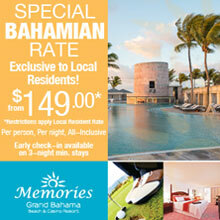 Freeport, Grand Bahama Island - Memories Grand Bahama Beach Resort is taking Staycation to a whole new level! Now, from just $149.00* per person, per night Bahamas residents can enjoy the luxury of an All-Inclusive stay at their their fabulous oceanfront resort! Just imagine, savoring sumptuous dishes prepared with fresh, authentic ingredients at Memories 4 restaurants and enjoying cool thirst quenching refreshments at 6 themed bars with international and local brands of liquors. Plus Free Wifi and more! 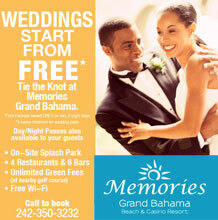 Freeport, Grand Bahama Island what better way to spend your day than at Memories Grand Bahama Beach & Casino Resort? Bahamas residents Day and Night Passes are just $80 for adults and 50% off for kids (2 - 12). It's guaranteed great all inclusive fun for your entire family day or night with Memories Passes! Day (9am—6pm) Night (6pm-2am). 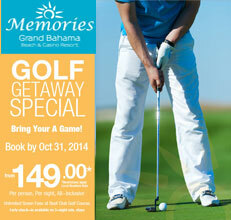 Freeport, Grand Bahama Island - If you're a golfer then Memories Grand Bahama Beach & Casino Resort's Golf Getway Special is just what you need to bring your A game! When you book by October 31st, 2014 you get an all inclusive rate from $149* per person per night with unlimited Green Fees at Reef Golf Course! Early check-in available on 3 night min. stays. •Early check-in available on 3-night min. stays. 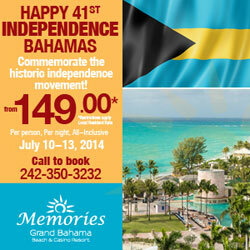 Happy 41st Independence Bahamas - Commemorate this historic independence moment July 10th - 13th at Memories Grand Bahama Beach Resort! Now, from just $149.00* per person, per night Bahamas residents can enjoy the luxury of an All-Inclusive stay at their their fabulous oceanfront resort! Family-friendly facilities include their on-site Splash Park with slides for kids, and a Teens Club for ages 13 to 17. Enjoy unlimited Green Fees (at nearby golf course) Plus Free Wifi and more! Call 242-350-3232 and book your reservations TODAY!